Overglaze decoration (and often underglaze also) often bleed on the edges, especially brushstrokes. 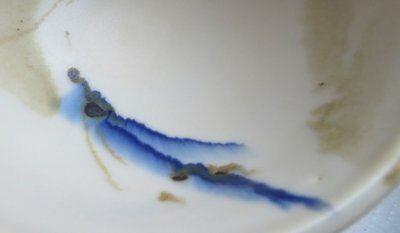 The higher the melt fluidity of the colored layer the more bleeding will occur, especially if the over or under glaze is also fluid. Cobalt colors are often more fluid and runny, that is why this problem is most commonly seen with blues. While there are other factors, control of the melt fluidity of the glaze and colored under/over glaze is the most important. Matte glazes tend to be more stable (less fluid) and thus host overglaze colors better (although some matte glazes are still fluid because their matteness mechanism is surface crystallization during cooling). The thickness of the glaze layer is also important, some glazes are stable on vertical surfaces, up to a point, after which that stability quickly degrades as they begin to run. It is thus important to know the degree of melt fluidity for both your glaze and over/underglazes. Take the time to make melt fluidity test balls to compare them. Stain powders are not just mixed with water and painted on to ware. They need to be part of a recipe: A base with a color addition. The base is a transparent matte or glossy glaze having as low a melt fluidity and LOI as possible yet still producing a good glass. It also has a chemistry that is sympathetic to the stains being used (stain companies outline chemistry requirements for host glazes in their documentation). Bases will almost always be very high in frit content. They will also contain 1-1.5% gum to make them brush well and dry slowly. However there is a problem. 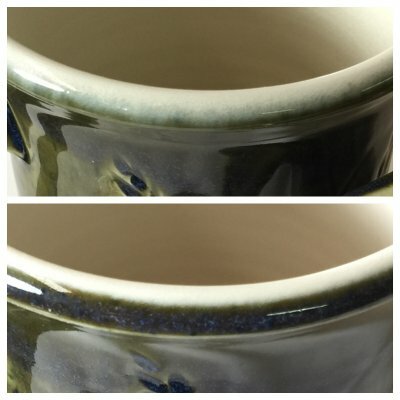 Different stains have differing color strengths and different effects on glaze melt fluidity (and even other properties like thermal expansion). Powerful colors, like blue, will likely not comprise more than 10% (with 90% base). Others, like yellow, will need a much higher percentage. Through testing the coloring power of each stain can be assessed (and its percentage adjusted). Its effect on melt fluidity should be adjusted for. How? One way is to have two or three variations on the base, spanning a range from very stiff melt (even incompletely melted) to one that melts very well (even too much). As an example, suppose you are using a magnesia matte cone 6 glaze, like G2934Y and a color is making it too fluid. Try replacing half of the G2934Y with a cone 10 magnesia matte, G2571A. If the opposite is needed, add a balanced frit like Ferro 3195 to make it melt better. Adjusting the recipe to accommodate each color requires considerable testing (some commercial glaze manufacturers do not even do this and the variations in their products demonstrate that). But if you are developing your own colors, seriously consider doing the work necessary to make them work properly. Start with one color, then two, then more. An added benefit will be the ability to see how subtle visual effects on colours change as their melt fluidity is adjusted. Commercial underglaze colors fired at cone 5 in a flow tester. Underglazes blend stains with a host recipe that should fuse them enough to adhere well to the body (two of these have not even begun to do that). The blue, green and red are from one manufacturer. Stain powders have different melting temperatures, so underglaze formulators must treat each stain individually, customizing the underglaze recipe to its melting behavior. As you can see, they have failed to do that here, the pink one has shrunk to half its size and is about to melt (it needs less flux). The green one is only sintered (it needs more flux). The black underglaze (D) (from a second manufacturer) contains gassing materials, it has become an Aero chocolate bar and is about to race down the runway. The E black (a third manufacturer) has not even started to melt or even sinter. The blacks were plastic, the colored ones were not. I am confused. How could the glaze possibly stick well to the body with the green or unmelted black under it? Commercial underglaze colors fired at cone 8 in a flow tester (this is another good example of how valuable flow testers are). 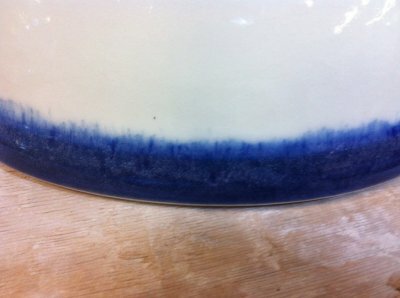 Underglazes need to melt enough to bond with the underlying body, but not so much that edges of designs bleed excessively into the overlying glaze. A regular glaze would melt enough to run well down the runway on this tester, but an underglaze should flow much less. The green one here is clearly not sufficiently developed. The black is too melted (and contains volatiles that are gasing). The pink is much further along than the blue. And cone 5, these samples all melt significantly less. Clearly, underglazes need to be targeted to melt at specific temperatures and each color needs specific formulation attention. Silk screening and inkjet printing are increasingly popular and these processes need ink that will fuse to the surface of the body.